Portuguese-born, Berlin-based artist Leonor Antunes receives her inspiration from tropes within modern art, architecture, and design. Reconsidering and reimagining their applications to sculpture and space, she creates works by questioning and surveying spatial relationships and interactivity while simultaneously taking into consideration the properties of light. Utilizing an array of materials such as metal, rope, and glass, the artist focuses not just on those traditional techniques, but also engages in an ongoing dialogue with the surrounding environment and its evolution across time. Antunes takes in to account the historicity and identity of each space where she exhibits and sees a connection they establish with one another. 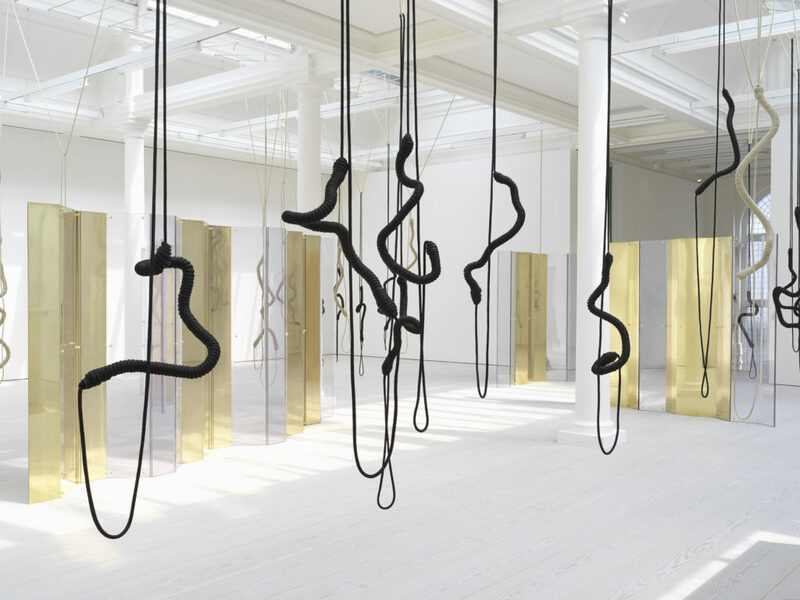 Recently presenting the frisson of the togetherness, a solo exhibition at the Whitechapel Gallery in London, Antunes’ other recent solos include New Work: Leonor Antunes at the San Francisco Museum of Modern Art (2016), the pliable plane at CAPC in Bordeaux (2015), the last days in chimalistac at Kunsthalle in Basel (2013), and at the Museo Tamayo in Mexico City (June 2018). Coinciding with the occasion of her solo show at Marian Goodman Gallery in London, a thousand realities from an original mark, I invited Antunes to discuss the way her work shapes and swings between diverse conceptual parameters and social contexts. Kostas Prapoglou: The works on view at Marian Goodman in London engage in an active dialogue with the works of certain female protagonists of the twentieth century such as Mary Martin, Anni Albers, and Alison Smithson. What were the criteria of choosing these individuals, and to what degree have their bodies of work influenced your visual vocabulary? Leonor Antunes: I was interested in making an exhibition in London that is linked to its context and art history. Mary Martin had been an important artist during the British constructivist period whose practice responded to the material and aesthetic potential of geometrical systems and their architectural implications, but her work has not seen much recognition outside the UK. As her work developed a constructive idiom, Martin maintained a role as the primary maker of her work, so there is a sense of craftsmanship that I think is inherent to some of her peers. The scale and facture lend her constructions an experimental and provisional quality, which opens the work to levels of contingency. Some of her drawings and studies are very similar to the ones done by Anni Albers. Martin also studied weaving, not thinking of it as an art form, but rather, as a survival kit. She sold all her weavings and did a few commissions. 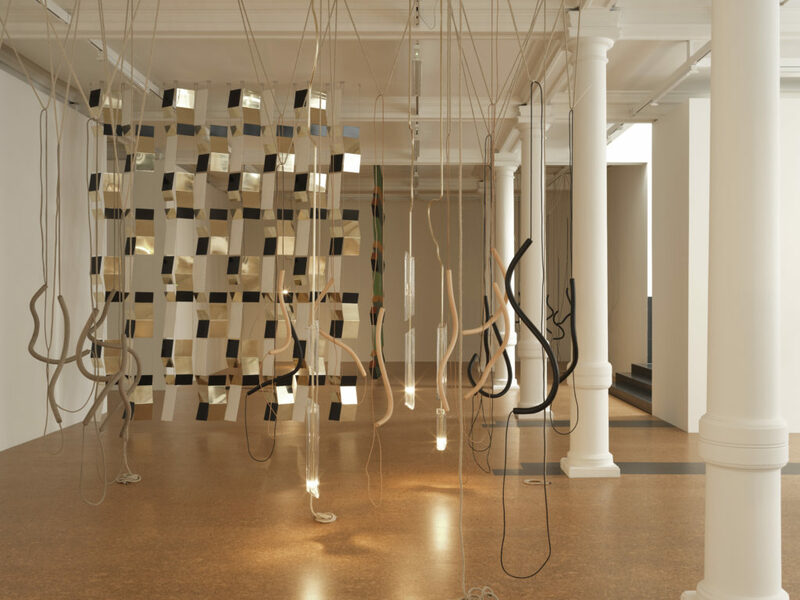 Leonor Antunes, installation view of A.S in the S.P, 2018, Marian Goodman Gallery, London. Brass and polycarbonate screens. Dimensions variable. Courtesy of the artist and Marian Goodman Gallery, London. Last year, at my exhibition at the Whitechapel Gallery, I showed one of her weavings which belongs to her son—the artist Paul Martin—on one of the side rooms. Together with her weaving, I also presented five pieces of jewellery made by the artist Lucia Nogueira, another artist based in London. This gesture was linked to establish connections using other artists’ works, which were not considered by themselves, art forms. I asked her former partner, Anthony Reynolds, to lend us a few pieces, where she had only used one piece of silver wire and installed it in jewellery cases designed by Danish designer Nanna Ditzel. Ditzel conceived those jewellery cases for an exhibition she designed after visiting Mexico and was very impressed by the glass bowls and museum displays of collections of crafts and archaeological objects. She was very taken by how museum lit their collections. I see this exhibition at Marian Goodman in London as a continuation of the exhibition at the Whitechapel Gallery. I established analogies between artists and works which I find to have a kind of a sense of likeness and interest in crafts and materials by their nature and worked with the legacy of modernism not through industrialisation but rather through craftsmanship. KP: Space and light are vital components in the creation of your sculptural works. Has this always been the case and how does architecture shape the way you think? LA: Space is decisive, but so is the nature of some of my sculptures—I would always prefer to use daylight, and be able to establish a relationship with the context outside. But that is not often the case; I have done shows where I used no artificial light. When it is not possible, I remove all the existing lights and use my own lamps. Or, as in the case of the Pirelli HangarBicocca, where I am doing an exhibition this September, we are opening all the skylights in that space, which have never been opened before. Light modulates space, creates volumes, and acts as just one aspect of perception in its activation. and Marian Goodman Gallery, London. KP: Craft, and weaving in particular, play a pivotal role in your artistic language. To what extent do you see craft as the conduit of memory, preservation, and, perhaps, continuation? LA: Craft is related to memory, culture, and to a specific knowhow, acquired only through time and perseverance. That is one of the reasons I respect and admire Japanese culture. I find that such culture deals most remarkably with this notion of passing knowledge, historically speaking. If we think of old Japanese shrines, they are dismantled every twenty years and new ones are built on adjacent sites to the exact same specifications, so the buildings will be forever new and forever ancient and original. They are rebuilt in the same way in exact detail, with the same type of wood which was planted in the same spot as the former ones were cut, using ancient carpentry skills, which are connected with only carved joints, and no additional hardware. This specific knowledge of carpentry is not lost either—it is transmitted within the families. KP: Your exhibited works generate a vivid conversation between the legacy of modern artists through the eyes of the contemporary art viewer. What are the reactions of your audience depending on different age groups? Do younger viewers detect this visual reference? LA: Probably not, but it is also not relevant. I think of children when installing my works, I guess because I have a child, I bring my daughter to see exhibitions and she is often in my studio—in that sense I am very aware of how she places herself in those situations. It happens in several exhibitions where I create small passages for them that no other people can pass through; I do not need to explain this to anybody. I think it will be very clear for them, and will intuitively impact the children’s understanding or establishment of their personal relation to that space. At that moment, they feel they had found their own secret passage and as soon as they discover something secretively they can also relate to it. It is very physical. Everything is very tactical and in its own presence so to say. Placing the work in space is very important for me. Everything can change depending on how it sits, it stands, and how you navigate yourself through it. London. Leather, aluminum tube, silicon tube, waxed nylon yarn, hemp rope. Dimensions variable. Courtesy of the artist and Marian Goodman Gallery, London. Photo Credit: Nick Ash. KP: You have worked and exhibited in many countries across the world. Do you sense different reactions towards your works at different geographical locations? 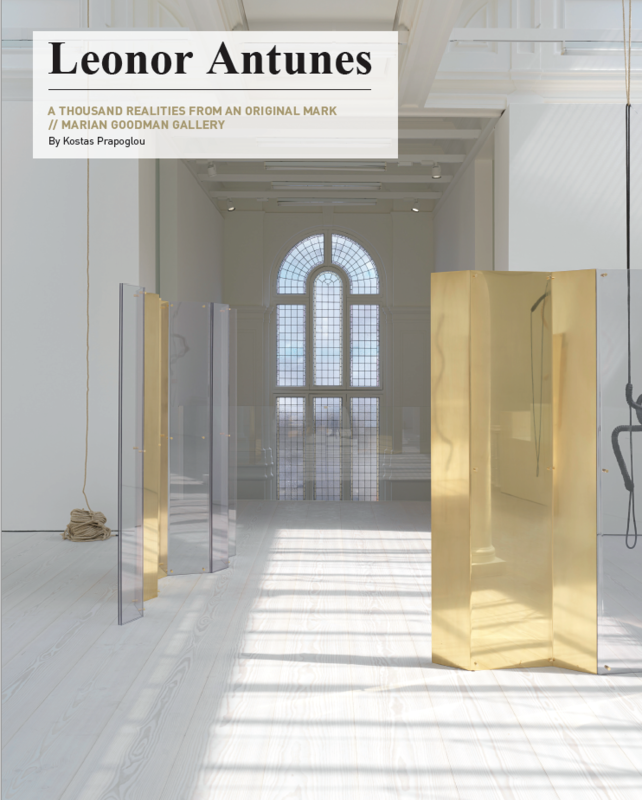 Does tradition play an important role when it comes to reading a work of contemporary art? LA: I have just installed the exhibition discrepancies with C.P at the Museo Tamayo in Mexico City. C.P stands for Clara Porset, a Cuban designer who was exiled in Mexico where she lived and worked. I have done in the past some research on her work and have worked with it but not in a very direct way in two other exhibitions in 2011; in Mexico City at Museo Experimental El Eco, and at the Kunsthalle Basel in 2014. I guess I was waiting for this exhibition to happen, to have the opportunity to create those new works. And the reason why I am saying this, is I think this show plays, in a way, a central part in my work. in this sense that I am trying to understand that as a foreigner—and I will always be seen as one–I am nevertheless very interested in the context specificity where I am showing my work. It is also an exhibition for the local audience. KP: If you were to exhibit at a nongallery and non-institutional space anywhere in the world, where would that be? LA: I have never thought about it. I think of places I would like to exhibit my work, more in terms of the local history of that place and its surroundings. It is very rare to materialize an exhibition in a space we idealize, unless it is a space we— artists—create ourselves. However, I would rather exhibit my work in spaces made by others. It helps me decide where my work can be placed and how it should be done. I am interested in travelling for research purposes, places like Japan and Western Africa for example, where I have never exhibited before. Leonor Antunes: the last days in Galliati at the Pirelli HangarBicocca in Milan runs through January 13, 2019. 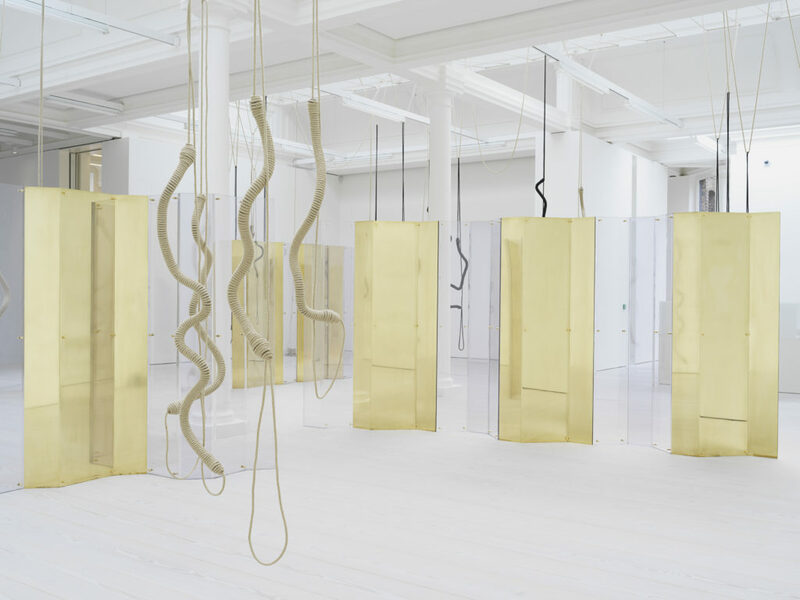 September 26, 2018 | Filed under Art Seen: International and tagged with Kostas Prapoglou, Leonor Antunes.